I will certainly read it, but, from the title, I'm not really looking forward to James McWilliams' new book, Just Food: Where Locavores Get It Wrong and How We Can Truly Eat Responsibly. In a recent radio interview, McWilliams really objected to a certain kind of strictly dogmatic 100-mile-circle type food discipline. That seems like a true and fairly bland point. It would be good environmentalism if Americans ate food that has less processing, less meat, and comes from closer to home, on average, but that doesn't mean all food should come from right nearby. In the meanwhile, Kerry Trueman's review at Eating Liberally certainly was fun. The lead sentence describes the book as "the literary equivalent of a turd blossom, the Texan term for a flower that pops up out of a cow patty." Kerry reminds the reader of McWilliams' credulous New York Times piece about a study of trichinosis in free-range pork, which was the subject of an editor's note acknowledging that the study's Pork Board funding should have been mentioned. She gives examples of McWilliams' "pointless ponderings": "What would happen to local traffic patterns if every consumer in Austin made daily trips in their SUVs to visit small local farms to buy locally produced food?" Hmm. I guess I never really wondered that. But, if I had, I would have agreed it was a bad idea. And, generously, she draws out "the needle in McWilliams' hyperbolic, straw man-stuffed haystack." She says McWilliams' criticism of current meat consumption patterns hits home more strongly than does his caricature of locavores: "McWilliams evidently made the calculus that it would be more lucrative to demonize farmers' market fanatics than mindless meat eaters, but his opportunistic posturing ultimately overwhelms the more thoughtful analyses contained in this book." I'm just glad McWilliams relented on the originally planned subtitle for the book: "How Locavores Are Endangering The Future of Food." With that title, I would have felt free to skip the book altogether. USDA Deputy Secretary of Agriculture Kathleen Merrigan sent out a memo to all of her staff as well as other interested parties regarding three rural development programs that she thinks can be better utilized in the development of local and regional food systems. She states that she would "like to play the role of match-maker during this Administration" by helping USDA program administrators better understand how programs can serve their efforts. Community Facilities Program (CF) - Imagine USDA funds being used to build a community kitchen, to build an open-sided structure for a farmers market, or to construct a cold storage facility to help schools retrofit the cafeteria to buy produce directly from farmers. CF supports the success of rural communities by providing loans and grants for the construction, acquisition, or renovation of community facilities or for the purchase of equipment for community projects. Businesss and Industry (B&I) Guarentee Loan Program- Imagine USDA funds being used to aggregate local farm products to better serve institutions, to fund a mobile slaughterhouse to support local free-range poultry growers, or to help food processors add equipment and storage to handle organic certification. The B&I program helps new and existing businesses in rural areas to gain access to affordable capital with favorable interests rates and terms. Value-Added Producer Grants (VAPG) - Imagine USDA funds being used to conduct a feasibility study of providing local food in schools, to help farmers with direct marketing of pasture-raised meat in restaurants, or to help farmers with marketing sustainably grown or raised food. The VAPG grants provide funding to agricultural producers who add value to their raw products through processing or marketing, thereby increasing farm income. The memo runs through eligibility guidelines, grant amounts and terms, program priorities and information on how to apply, all which can be found on the USDA website. The Arlington, MA, Board of Selectmen earlier this month voted "yes" 4-to-1 on a plan under development to renovate Massachusetts avenue in the eastern half of the town. The vote will now send the plans to the Mass highway department for their review. Mass highway will then sponsor its own public hearing some time this Fall. The plan would help motorists, pedestrians, and cyclists by improving stoplight siting and equipment, marking lanes more clearly, adjusting lanes according to engineering estimates of traffic flow, putting in "bumpouts" so pedestrians have a shorter distance to safely cross the avenue, and adding bike lanes. The plan has enthusiastic support from some businesses and many residents, including me, who believe it will make the neighborhood and business district more vibrant. Still, the Selectmen's vote required some courage. At one public meeting at Fox Library, some opponents were so angry, refusing to let the moderator call the next speaker, that a patient Arlington policeman had to be called in to keep order. (A later, larger, meeting at Hardy Elementary School was more civil, with a genuine sharing of views about a revised plan that addressed many of the original concerns). Some opponents say there has been insufficient discussion, even though the town has been collecting community input for many months through an exceptionally open planning process. Some people at my church were concerned with an early plan's proposal to remove a traffic light at Linwood Street, but the revised plan approved by Selectmen had remedied those concerns. Some businesses have reasonable concerns about the disruption of the road work, but the engineers and community leaders are addressing those concerns vigorously, and other businesses are on balance hopeful about the changes. A neighborhood group called the East Arlington Livable Streets Coalition (EALS) has my support, organizing supporters when appropriate and also communicating reasonable concerns in a balanced way to project designers when appropriate. One sad theme for some opponents has been some prejudice against cyclists. It is a view I have heard elsewhere in the community, too, such as a mean and tasteless piece in the Boston Globe recently, in which a car-driver fantasizes about bullying cyclists by driving right up close behind them and hitting the horn. The Globe also mischaracterized the balance of community opinion in recent coverage of the Selectmen's vote, drawing a fair response from EALS organizer Phil Goff. Early coverage in the Arlington Advocate seemed to treat the opponents as if they represented the whole community, but more recent coverage has included the views of residents and businesses that have high hopes for the renovation. I am glad for the Selectmen's courage, which came from listening to the whole community and not just those who were shouting loudest. A recent Boston Globe article highlighted the increasing body of research demonstrating the link between American's increasing sweetened beverage consumption and obesity, as well as some local intervention efforts to change drinking behaviors. As these efforts continue to revamp with a number of sugar-free drink campaigns gearing up locally, a question about message and framing comes to mind. In the Cambridge study cited by the Globe, the kids were given bottled water and diet sodas, iced teas, lemonade, and punch reduced their consumption of sugar-sweetened beverages by 82% (no surprise there), and "the one-third who weighed the most at the start lost an average of three or four pounds." However, one must look at how this type of intervention would play out in real life. A recent conversation with an advocate from Corporate Accountability International's Value the Meal campaign against fast food companies, highlighted to me the difficulties in making these kinds of campaigns jibe with CAI's other campaign of Think Outside the Bottle to encourage individuals, communities and larger entities to switch from bottled water to tap water. 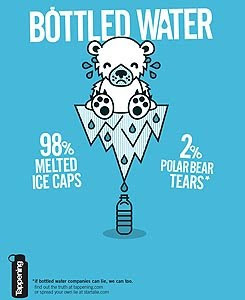 Often bottled water is presented as the "easy" alternative to soda or other sweetened drinks, thus increasing the number of people drinking bottled water. Especially with kids, it is often harder to make the switch to tap water, which may have a stigma associated with it, even in locations where its quality, based on mandatory testing, is far superior to that of bottled water. Of course, this complicates efforts to change the product mix among corporations such as Coca-Cola and Pepsi, which produce both sweetened beverages and bottled water. Although they have come out strong against efforts to pinpoint sweetened beverage consumption as a leading cause of obesity, they would be most sensitive to sales, and presumably change their product mix to more water and less soda if the market "demands" it. 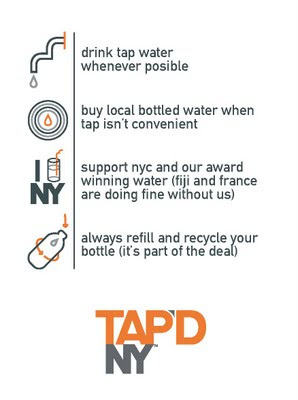 What happens if the market switches to tap water? Do they come out and lobby harder or change their marketing strategies? Update: Boston Globe reports that bottled water sales are down due to the recession, rather than due to common sense. From the Anti-Advertising agency blog, a link to a PSA-style graphic from Tappening, which also has a funny "Start A Lie" campaign. Slogan: "If they can lie, so can you." In the Mother Jones article, there is a cameo appearance by Lynda Resnick, a genius of trendy lefty New Age marketing who once showed up on this blog in a post about pseudo-scientific marketing of the powers of pomegranate juice. Time Magazine on "America's Food Crisis"
Time Magazine today gives a polished and highly readable summary of contemporary issues in U.S. food policy, titled "America's Food Crisis." The report by Bryan Walsh is strongly worded, and the choice of sources for commentary seems daring. Many readers will have seen most of the article's themes elsewhere already, but the major news magazine's writing style gives these themes some mainstream appeal without watering them down very much. The article addresses both personal choices (local buying decisions) and policy issues (nontherapeutic antibiotics). It includes both non-commercial responses (home gardening) and commercial responses (Niman Farms, Chipotle, Bon Appetit) to environmental and sustainability concerns. The accompanying multimedia is slick, including a nice photo essay about two farmers and the video below about organic vegetable gardening (you'll have to excuse the advertisement and the quirky references to "generation x" as a description for young people). 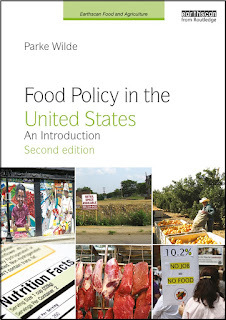 Although it can at times be a little wonky, Parke Wilde’s blog U.S. Food Policy is a good stop for those interested in policy. (To a certain extent, we all should be.) A food economist at Tufts University, Wilde has help maintaining his blog from a couple of others; together, their posts — such as a recent one that maps 10 U.S. food-policy destinations using Google Maps — enlighten and clarify. We are also amused to be tagged as "a little wonky." First, fellow Registered Dietitian, and friend, Melinda Hemmelgarn has started a weekly 1/2 radio program – taped interviews with innovative, insightful and interesting guests who will help listeners "think beyond their plates" and connect the dots between food, health and agriculture. The show airs on Thursdays at 5:00 p.m. Central and you can listen live on line at: www.kopn.org or listen to podcasts as they're posted. KOPN is a 35-year-and-still-going-strong community–owned, volunteer-run radio station – Free press at its finest with NO commercials. Second, as previously posted, Tufts very own Jessica Ilyse Smith is a producer and journalist for the Public Radio International show, Living on Earth. Though the show is not entirely focused on sustainable food, she covers food issues as much as possible. Some topics she has covered include food deserts and the pros and cons of GE corn ethanol. Tufts Friedman School of Nutrition Science and Policy also has its own Internet Radio Program that Jessica contributed to along with our own blog contributor Aliza Wasserman. Third, Heritage Radio Network(HRN) is "a cutting edge internet-based radio station designed to protect and advance our country’s rich cultural roots in the form of interviews, reflections, musings and ramblings from America’s leading farmers, food mavericks, filmmakers, artists and tastemakers. The live radio shows are then uploaded onto heritageradionetwork.com where content is archived into audio bits and pieces and searchable by keywords or phrases. This is an unprecedented venue for future historians who want to research their past, our present." Edible Communities Hosted by: Kate Manchester, Marla Camp and Deborah Schapiro Celebrating the abundance of local foods, season by season. Heritage Farm Report Hosted by: Heather Hyman and Lorenzo Ragionieri A day in the life of a Heritage Farmer. America's leading farmers discuss the history of their land, avant-garde farming techniques, and farming how-to's. Greenhorn Radio Hosted by: Severine von Tscharner Fleming Greenhorn Radio: Radio For Young Farmers, By Young Farmers. Acclaimed activist, farmer, and documentarian Severine Fleming surveys America's cutting edge, under-forty farmers. Fourth, The National Center for Appropriate Technology's Sustainable Agriculture Spotlight is a weekly Internet radio show. The show covers a wide range of topics on sustainable agriculture, including on-farm production of biodiesel, integrated pest management, growing crops for farmers' markets, organic crop certification and federal farm policy. Each week host Jeff Birkby, ATTRA outreach directory, interviews regional and national experts. The show airs live Thursdays at 10 a.m. Pacific Time on the Green Talk Network. Archives are listed 24 hours after the show. Last, but not least, is my new favorite guilty pleasure: Agritalk Radio: The Voice of Rural America. I download Agritalk as a podcast and listen to it on my way to school. The show is hosted by Mike Adams and may help us "agricultural intellectuals" understand issues important to American farmers. There is a ton of policy discussion and guest interviews from agricultural state representatives and agricultural committee members. Scattered throughout the show are commercials from our favorite big agricultural corporations, Checkoff programs, and the AdCouncil. My favorite episode is the June 2nd show: The Growth of Small Farms with guest Agricultural Economist, John Ikerd.